AllOver Media is the nation’s leading provider of gas pump advertising, and has paid millions of dollars to thousands of gas station owners for gas pump advertising space since 2003. We work with single independent station owners as well as major chains. Whether you are interested in earning additional advertising revenue or looking for a partner to help you grow your business through custom signage programs, AllOver Media has got a program that is right for you. GET PAID TO ENERGIZE YOUR STORE WITH ADVERTISING! AllOver Media pays station owners for use of their gas pump top advertising space, and only uses half of the facings at the pump so that you can still be in compliance with the brand requirements of most oil companies. 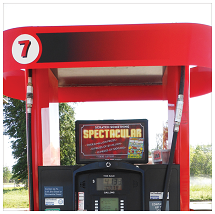 We also provide full color, weather proof, custom and pre-designed category ads for you to choose from if you would like to run your own promotions at the pump. 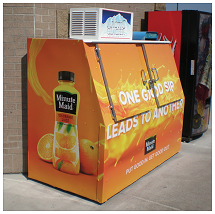 Frozen Billboards™ are vinyl Ice Box Wraps that transform your ice box into a unique, three-dimensional outdoor advertising display. AllOver Media has exclusive agreements in place with national and regional ice companies and has wrapped ice boxes in all 50 states. We use only the highest quality vinyl materials and professional vinyl wrappers. 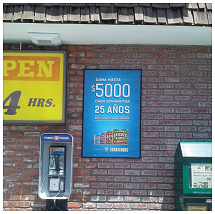 1-Sheet Posters & Window Posters are displayed in highly visible, high-traffic locations (on exterior walls) at the entrances of Gas Stations, Convenience Stores, Construction Sites, Marinas, Bodegas and Campgrounds within high-density Latino neighborhoods. Our advertising displays can be easily viewed by retail location patron traffic, as well as, pedestrian and automobile traffic.